Mega Sale! 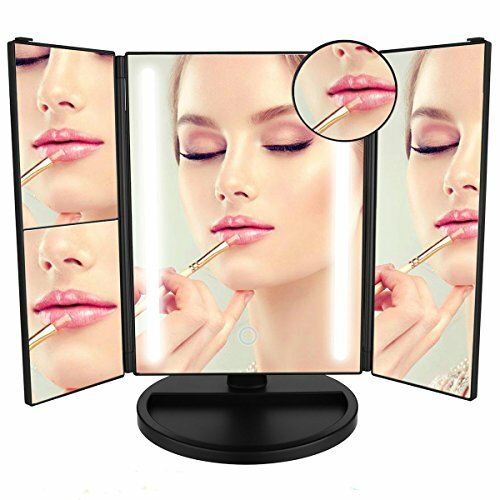 Save 28% on the LEPO LED Makeup Mirror, Makeup Vanity Mirror with 1X/2X/3X/10X Magnification, Cosmetic Mirror with 24 LED Lights, 180 Degree Adjustable Rotation (Black) by LEPO at N Online Agency. MPN: LEPO-1. Hurry! Limited time offer. Offer valid only while supplies last. Specifications: 1. Size: 10.83*7.09 inches (unfolded mirror) 2. Magnification: 1x/2x/3x/10x3. Material: ABS+Mirror Glass4. 180 Degree rotation5. 6. Power control: On/Off button is located in the middle of the mirror. 7. LED control: Brightness is adjustable by touch sensor switch, long press to dim the light. 1. Sleek look and magnification. 2. Made from premium ABS material with UV coating, perfect looking and resistance for scratch. 3. You can carry with you to anywhere with compact size trifold design. 4. In the darkness, pub or car, our makeup mirror enables you to apply your makeup more easily at any time. 5. Perfect cosmetic gift on Valentine's Day, Mother's Day or other special occasions for Mom, Sister, Wife, Girlfriend, Makeup Guru, etc. 1. Please don't power it on by USB charging and battery at the same time. 2. The tri-fold cosmetic mirror can't store power by itself. Brand-New LED Mirror: LEPO makeup mirror is equipped with 24 small led lights to provide enough bright. The eye-caring led light can be freely adjusted by pressing the touch sensor. Magnifying Mirror for Makeup: This led makeup mirror gives you 1X/2X/3X/10X magnification. The portable magnifying mirror is a great helper for your flawless makeup. 180 Degree Adjustable Rotation: The vanity mirror has an adjustable stand for 180 degree rotation for different view angles. The base works as a holder for your small items. It can't be turned left or right. Convenient Makeup Mirror: This makeup vanity mirror is powered by 4 pcs of AA batteries(not included) or through a USB charging cable. The package includes an eyebrow razor and cleaning cloth. Great Gift Idea: The tri fold mirror is well packaged in a beautiful box. It's an awesome gift for girls and ladies.Your package might contain a pink or white eyebrow razor at random for a free gift. If you have any questions about this product by LEPO, contact us by completing and submitting the form below. If you are looking for a specif part number, please include it with your message.